Someone told me that Samsung Galaxy Note 5 is the smoothest, sleekest stylus-equipped jumbo-screen smartphone that the company has ever made. A slim, shiny, large-screened luster; strong camera; retooled stylus; and killer battery life. All of these pushes you to purchase a Samsung Galaxy Note 5. Now You have it, and wondering how to switch from your old phone to this new device. No sweat, this article will show you the easiest way to finish this job. The One-Click Data Transfer tool works for both Androif & iOS devices. Follow these quick steps to transfer your data safely and easily, including contacts, messages, call history, photos, videos, songs, bookmarks and so on. Connect your both your old phone and Samsung Galaxy Note 5 to your computer and launch the Syncios Samsung Data Transfer (Any detection problem, click here). You will see the main screen shows connecting devices is required. 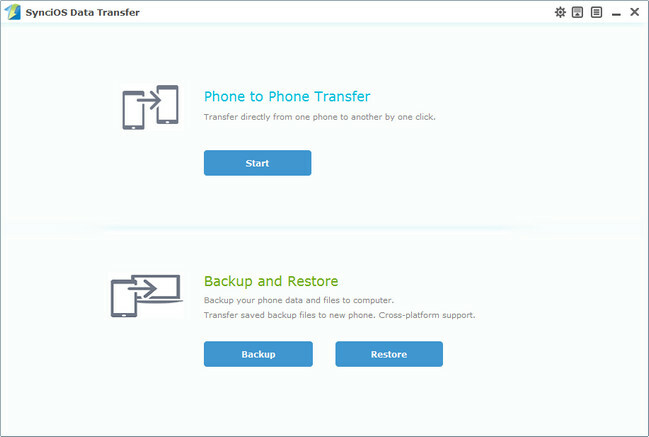 There are 3 modes: Phone to Phone Transfer, Phone to PC Backup, Pc to Mobile Restore. Click the "Start" button under Phone to Phone Transfer mode. Then it would display the the backup list. 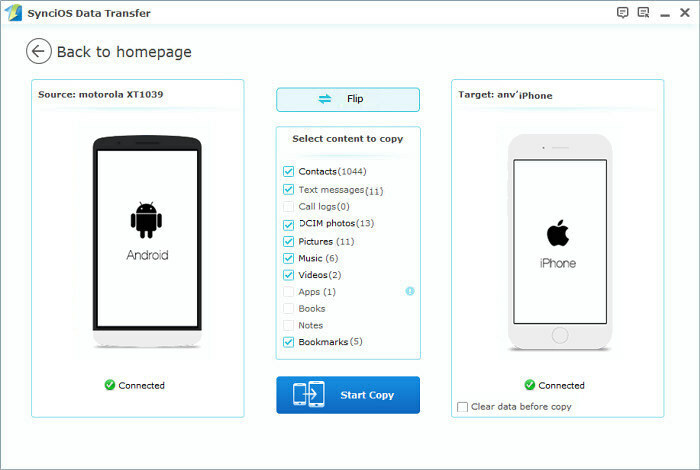 This iPhone to Android data transfer tool works on Windows and Mac OSX with good support for the latest version, you can choose the right version according to your computer OS. It will be just a second before the program recognize them. Make sure your source phone is on the left side while Samsung Galaxy Note 5 on the right. If not, click "Flip" to exchange the source device and target device. 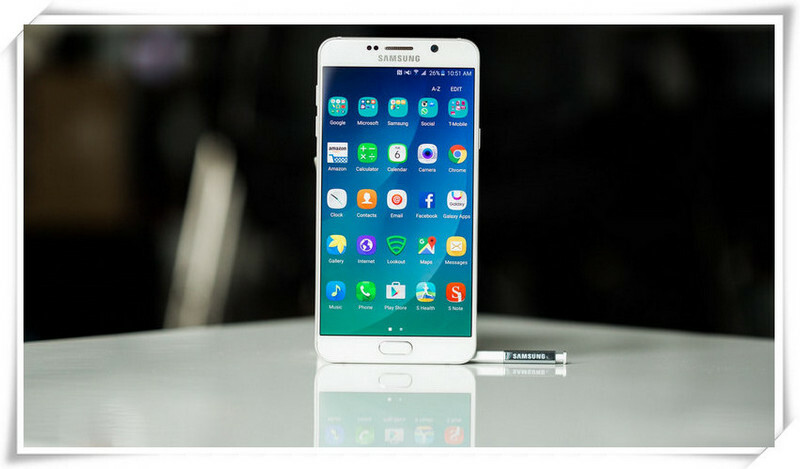 On the middle panel, check data (contacts, text messages, call logs, photos, music, videos, apps, calendars, bookmarks) to transfer from old phone to new Samsung Galaxy Note 5 as your will. Press the blue button "Start Copy" and the details will be shown in the interface. After a while, all of conetent will be saved on your Samsung Galaxy Note 5. Appandora is a free yet powerful iPod/iPhone/iPad/Android to PC transfer software that enables you transfer App, Music, Photo, Video and Ebook between PC and your iPod/iPhone/iPad/Android devices. Besides this, you can also get unlimited wallpaper and rington on iPhone/iPad by Appandora Mobile Manager.